How great is it to work for a company where you can work so out of the box and create something as zany and uber nutso as this! 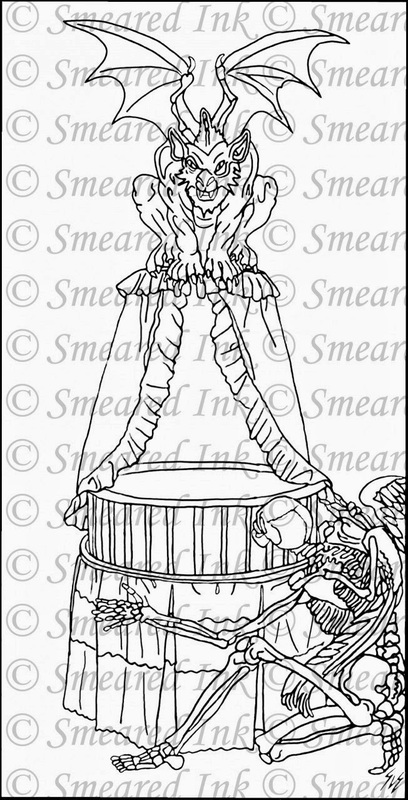 I have used a Gargoyle (I know, a stretch for angels), a wee little girl's body and a gorgeous set of locks for the head. 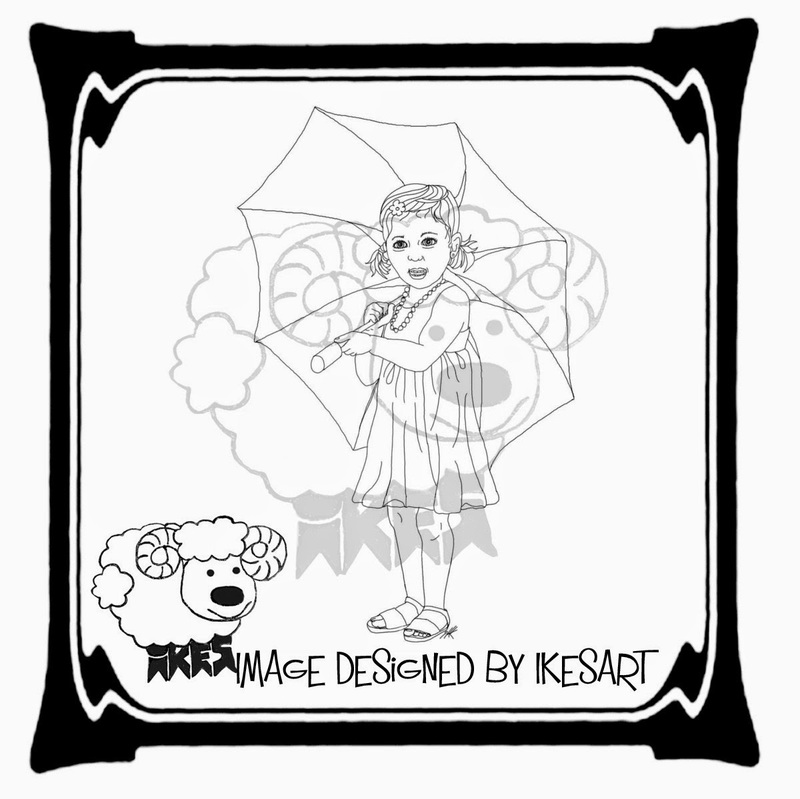 MEDUSA is the head, MY UMBRELLA is the little girl and RB is the gargoyle - an angel to many, a Guardian Angel! Now - for you! You have to go over to IKE'S BLOG to see uber out of the box also. Really neat stuffs. 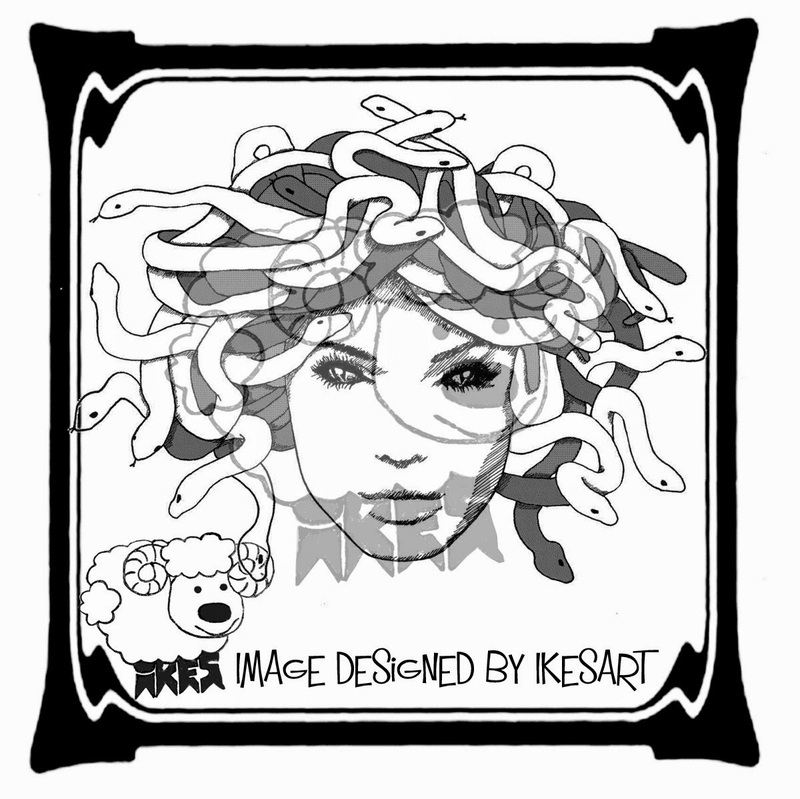 And then to the IKE'S STORE where she has all her sketches that can be used for any challenge where you have free reign to use a digi that isn't their own, then grab Ike's Freebie or get one of your own and come to IKE'S WORLD CHALLENGE and enter! The DT have some stellar work to inspire you so hop on the train and I'll see you there! This is one awesome exciting thing about being a DT on SLS. We get to work with SLS's New Releases as they are released to the public! I loved this image - the witches looked so nice, calm and like "good witches" to me - like "white witches" not dark witches. That made me happy as witches are usually portrayed in such an awful and gruesome way. So this is what I have chosen. Be sure to check out the SLS Store and pick up what turns your crank, for the upcoming Halloween Celebration, or Solstice or to get your Holiday Cards on the way. When I saw this Steampunk Hat Image I thought she was SOOOOO cute but had NO idea how on earth to integrate her with a fleur! I colored her up, dumped out my tin of widgets and got out my glue gun, went through my fleurs and was sunk! Then I remembered this course I took at my quilting retreat on a special type of flower that was kind of vintagy and kind of funky. So out came some scraps and perfect! Just the right color and off I went. I used Textured grout on my card first, then some Sprays of every sort, company, homemade and not and then some Gold Gum. And down went Steampunk Hat. I toyed where to put my fleur and when I tucked her under the metals it felt just right! I hope you like what I created - I am rather happy how the flower turned out, given the theme was flower. So hope on over to OSAAT, put your own thought into Flower Theme and let's see what you come up with! See you over there. Stripes is a theme I have not had before. So many options. I chose something fairy radical - to have stripes going in every which way. I love Dilly Beans so the digi was easy to choose. It was a matter of just finding the right paper and off to the races. I hope you like my make. Looking forward to seeing what direction your stripes take you in. See you over at LOC on the entry board! Each one of us, at the Design Team, are allowed to do an "Inspirational Post" for the Theme of the Month. Something that speaks to us - free reign - something we think you might like to see, using for September LADIES. I've decided it was time to introduce naughty - why wait till Spring - just do it in the very first Challenge and very first moment on the Design Team. I picked "PIN UP GIRL," which I love. She is just gorgeous - such fantastic eyes - a real long away look in them. I love everything about this sketch and think that Sls really mastered this one (you will hear me say that almost every time I post as I am in love with the artiste's sketches! I hope my being racy lets you know that it's OK - go crazy, go wild, go dirty, go dark, go cute, go YOU! That is the most important thing...just go YOU - wherever YOU is that particular day with that particular sketch. Hop on over to SLS BLOG and take a look at what is happening over there, then over to SLS SHOP. You will see why racy, naughty, dark, nice, cute are all completely imaginable with Sls creative work! Drink up folks...and don't forget that last sip...you will want that one for sure!!! single click to see what is at the last sip! Now how cute is this. And I had the perfect use for it. My dad had a stroke 2 years ago and has been hospitalized ever since. It has been an excruciating decision for my mom to sell a 5,500 square foot house and move into an apartment, knowing she could not take care of this house without my youthful dad to use his mighty machines to do all the maintenance etc. that was his passion once they retired. She hummed and hawed if it was the right thing to move, or if it was a betrayal to my dad to sell the house. Well, she got the courage and made the decision a few months ago and got herself a beautiful 2 bedroom modest apartment in an 8 apartment building (really looks like a huge limestone house) and the best part - a number of her friends occupy a few of the apartments already. I went to see her this part weekend and it is gorgeous, she is so relaxed - like a teenager, we stayed in the same room (there is not much space to disperse as there was in the house) and we had a ball! She was light, funny, adventurous, and about as happy as I have seen her in the two years since she lost my dad. He doesn't recognize any of us - but his care facility is only 5 minutes away from her apartment - Perfect! I went to her Stoke support group with her - it is fantastic! She is making a real life for herself, while dealing with enormous grief losing my dad after 65 years all of a sudden Xmas Eve. But this apartment has given her a New Baby Fresh Lease On Life! 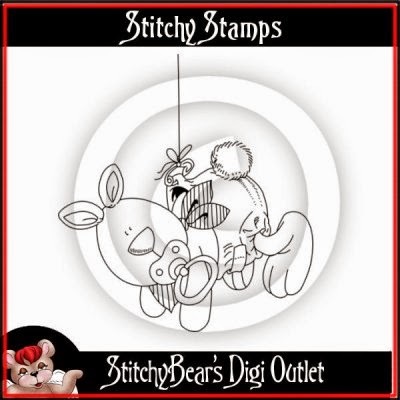 And Stitchy's Image was Perfectomundo for my mommy! So I did it up for her and she LOVED it! You will understand why, I am sure. She has begun again - is free of a huge burden, looking after a house all on her own - and even packed up the house all alone. My mom is a trailblazer! So here it is - DROPPIN IN - STITCHY'S NEW SEPTEMBER RELEASE. I hope you like it. I think the story is actually better than the card. And moral of this story is really beautiful. My dad was quite an awful man before the stroke and is now a loving, gentle, beautiful man. Two years of agony for my mom and I that he didn't pass with the stroke that left him not knowing who we are from one moment to the next but there is a silver lining - and that silver lining is HUGE - more huge than I can possible every describe here or portray how I feel about it here. I have watched my mom "fall in love" with her husband again, how I imagine she did when she met him, before he got so awful. I have fallen in love with my Daddy. I go see him and he holds out his arms and kisses my face and tears roll down his cheeks. He speaks total gobbligook and while I am telling him how much I love him over and over and stroking his face and kissing his face and hands he falls asleep into the most peaceful sleep. He opens his eyes and speaks again - total gobbligook and I say "I love you dad." "I don't know what you are saying to me but I know it is kind and loving and full of good things only and I love you for that. You are my dad and I've loved you forever." And he falls back asleep and I usually leave. If he is awake, when I leave tears roll down his face again and he kisses my face and neck. My dad would NEVER let me within 10 feet of him my entire life! So if there is destiny - this is why my dad didn't die with his stroke, when in all odds, he should have. He is a beautiful soul now and let's us in and we are able to let him in and feel safe. G-d Speaks. Thank you, if you have read this far. I rarely share my personal life in my blog - but that is what this card is all about and I would be remiss if I didn't honor a LOVE STORY while posting it. 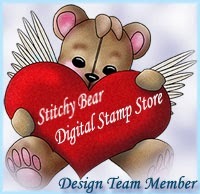 Please pop over to Stitchy's store and see if there is something new that speaks to you. As you can see, you never know where it will take you in YOUR process!!!! THIS IS A HUGE ANNOUNCEMENT! For the first Challenge, the THEME IS LADIES! Yeah for Ladies (let's hear it again) Yeah for Ladies! And our artiste, oh my gosh - you have to go over to slslines.etsy.com and check out all the digis, is so fantastic at creating "the ladies" it was not easy to chose...but here we are. I chose ELF GIRL WITH STAFF and used Copics to color her up. Then, using Close to my Heart paper, backgrounded her with an abundance of scraps. I wanted her to feel strong, yet womanly, very "Ayla" like (Clan of the Cave Bears - in fact I named my own daughter after Ayla from the book) but yet humble, so I chose soft paper. Because our LADY is both warrior and elf (of the land) I decided to add a Spiritual Verse to augment her beauty. I hope you like her. I loved playing around with Sls Art. Thanks beautiful one!